When you heard the words "mouth guard" what comes to mind? Mouth guards are commonly associated with contact sports. So, when your dentist suggests a night mouth guard, you may have some questions. You might wonder what it is, why you need it, or even if you really do need it. A night mouth guard is a simple dental appliance that is worn on the top teeth while you sleep. It acts as a protective cushion between your upper and lower jaws. It is usually made from plastic and is custom made from molds of your mouth. Its main job is to re-establish the natural space between your teeth and keeps them from rubbing together. Why Might Your Dentist Suggest a Mouth Guard? A night mouth guard is usually suggested if you suffer from bruxism, or the clenching and/or grinding of your teeth. Frequently caused by stress, the muscles in your jaw contract, which forces your jaw to exert unnecessary pressure on your teeth (clenching). Bruxism usually happens while you sleep, which means that you have no control over it. As a result, your teeth suffer excess wear. You may also experience jaw pain, receding gums and loose teeth that could potentially fall out. • Alcohol and caffeine (which act as stimulants). • Smoking or other drugs. Some medications may even cause bruxism. • Health issues such as sleep apnea. • Oral health issues such as misaligned teeth. 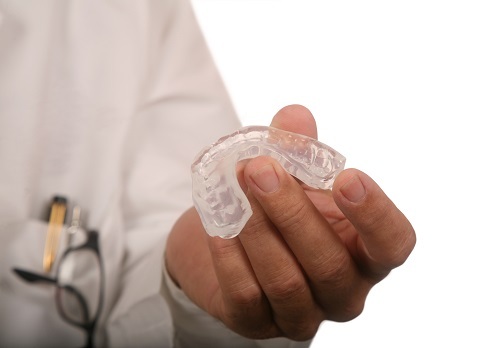 Do Mouth Guards Fix Bruxism? Practice stress management techniques - breathing techniques, yoga, meditation. You may even want to consider exercise. • Treat dental issues that may be causing bruxism. If your dentist suggests a night mouth guard, it is for a good reason. If you have any questions about it, contact our office today we will be more than happy to answer them for you.